Thomas William Sparrow was born in Toton, Nottinghamshire in 18812, the only son of three surviving children of William (b. c1852, Northleach, Gloucestershire) and Ruth Sparrow (b. 1856, Carsington, Derbyshire née Smith)3. On the face of it, he had a difficult life. In 1890, when he was nine, his mother died, shortly after the birth of fifth child, one of two that did not survive infancy. Although his father married again later the same year, Sarah, his second wife (née Smith) also died about three years later. In that short period, the family had lived at 39 Wollaton Road, Beeston where they had operated a grocer's shop while William continued his employment as a miner4. In the following year, May 1894, William emigrated to Canada, apparently leaving his two children in the care of family members or to work as servants5. By 1911, Thomas William, by then aged 29, was working as a baker's assistant and living with his employer's family at 36 Coupland Place Somercotes, Derbyshire6. As Thomas' Army Service Record has not survived, we do not have a precise date when he enlisted in the Army but it is likely to have been in May 19157 when he joined the Army Service Corps. The Corps ensured that the fighting soldiers were provided with food, equipment, horses and vehicles. Perhaps, as a baker in civilian life, Thomas was in some way using his skills in that trade. It appears that he was doing a good job as, in some records, it is recorded that he reached the rank of Acting Sergeant8. For what ever reason, at some stage, he was transferred to 7th (Service) Battalion Norfolk Regiment, apparently reverting to the rank of Private. It is not clear when or the reason why this happened but, in all probability, it resulted from the continual need to find more men for the front line. This battalion had been formed at Norwich in August 1914 as part of Kitchener's New Army and had landed in France at the end of May 1915 as part of 35th Infantry Brigade in 12th (Eastern) Division and had been involved in various actions on the Western Front throughout the remainder of 1915 and throughout 1916. In 1917, by which time it is likely that Thomas had joined the battalion on the Western Front, it was involved in several of the Scarpe battles around Arras9. In November, the Battalion, as part of 35th Infantry Brigade in 12th Division, took part on the Cambrai operation, described by Sir Douglas Haig as the gaining of a 'local success by a sudden attack at a point where the enemy did not expect it' and to some extent it succeeded. The proposed method of assault was new, with no preliminary artillery bombardment. Instead, tanks were be used to break through the German wire, with the infantry following under the cover of smoke barrages. The attack began early in the morning of 20 November 1917 and initial advances were remarkable. However, by 22 November, a halt was called for rest and reorganisation, allowing the Germans to reinforce. From 23 to 28 November, the fighting was concentrated almost entirely around Bourlon Wood and by 29 November, it was clear that the Germans were ready for a major counter attack. During the fierce fighting of the next five days, much of the ground gained in the initial days of the attack was lost. For the Allies, the results of the battle were ultimately disappointing but valuable lessons were learnt about new strategies and tactical approaches to fighting. The Germans had also discovered that their fixed lines of defence, no matter how well prepared, were vulnerable10. The counter attack by the enemy on the 30th November caught the 55th and 12th Divisions by surprise and became a total disaster. At 7am enemy the enemy bombarded with gas and then launched an attack with total surprise, penetrating the front which fell to the large masses of enemy infantry. Determined attempts to counterattack by the Brigade proved largely ineffective and the Brigade was forced to withdraw but with heavy casualties11. Private Sparrow was one of those missing during that terrible day. As his body was never found, he is commemorated on the CambraI Memorial which stands on a terrace at one end of the Louverval Military Cemetery, which is situated south of Louverval a small village on the north side of the N30, Bapaume to Cambrai road, 13 kilometres north-east of Bapaume and 16 kilometres south-west of Cambrai. The Memorial commemorates more than 7,000 servicemen of the United Kingdom and South Africa who died in the Battle of Cambrai in November and December 1917 and whose graves are not known. It was designed by H Chalton Bradshaw with sculpture by C S Jagger. The chateau at Louverval, was taken by the 56th Australian Infantry Battalion at dawn on 2 April 1917. The hamlet stayed in Allied hands until the 51st (Highland) Division was driven from it on 21 March 1918 during the great German advance, and it was retaken in the following September. Parts of Rows B and C of the cemetery were made between April and December 1917 and in 1927, graves were brought in from Louverval Chateau Cemetery, which had been begun by German troops in March 1918 and used by Commonwealth forces in September and October 1918. 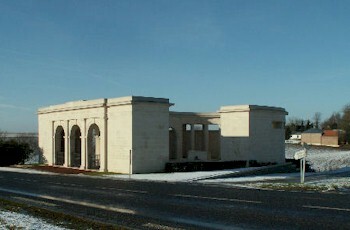 The cemetery now contains 124 First World War burials12. Private Sparrow was posthumously awarded the British War Medal and the Victory Medal13. His Army financial effects of £3 10 1d were paid to his sister Mary Hannah, as his sole legatee, on 10 March 1919, She also received his War Gratuity of £11 10s on 25 November 191914. Mary Hannah had married William P Smith in 1916 and died in 1952. His youngest sister, Clara Ann, had married John Thomas Jackson, a coal miner, in 1909 and died in 1948. His father died in York, Ontario, Canada in September 191914. 2His birth was registered in Shardlow Registration District (of which Toton was then part) in Q3/1881 (Ref 7b 461). He was baptised in Carsington, Derbyshire (is mother's parish of birth) on 25 December 1881. 3They had married at Attenborough Parish Church, Notts (which then served Toton) on 31 December 1879. Their two surviving daughters were Mary Hannah (b.1882) and Clara Ann (b. 1887). Two other daughters, Annie Elizabeth (b. 1884) and Nellie (b. 1890), died in infancy. 5In 1901, Mary Hannah was working as a domestic servant for a household in Callow, Derbyshire and Clara Ann was working as a domestic servant in her aunt and uncle's household in Kirk Ireton, Derbyshire. The location of Thomas William in 1901 has not been discovered. 7The year and month of his enlistment has been calculated based on the amount of his War Gratuity. 8His rank as Acting Sergeant and a Service Number of S4/094652 when with the Army Service Corps, is recorded on his entry in the Medal Rolls. 9This outline of the origins and deployment of 7th Battalion is based on that on the website at www.forces-war-records.co.uk/units/276/norfolk-regiment/. 11This account is based on the 12th Division's war diary - available at ancestry.com. 13Private Sparrow's medal awards are recorded in the Medal Rolls, available on ancestry.com.